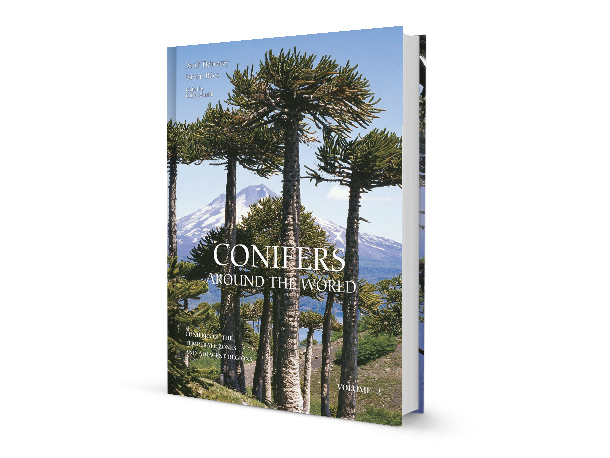 The conifers discussed in this chapter are native east of the Rocky Mountains. In the north, the continent’s climate conditions are relatively uniform across the arctic and boreal zones that stretch from just east of the Pacific Coast to the Atlantic Coast; a few conifers that follow these zones over vast east–west ranges are included here. There are 32 range maps, 13 conifer habitat photos and descriptions, and 35 full-page species profiles in this chapter (with a few samples below). The region discussed in this chapter covers the area from the Pacific Ocean to the eastern edge of the Rocky Mountains bordering the Great Plains, bounded to the north by the boreal region and to the south by the United States-Mexico border. Western North America is the world’s third richest region in temperate-zone conifers, with ~96 taxa including many endemics, primarily in California (20 endemic and 17 subendemic conifers in the state). This chapter contains 69 range maps, 21 conifer habitat photos and descriptions, and 75 full-page species profiles (see sample pages below). Although the region has a tropical climate, pines and junipers, members of primarily temperate genera, native to the islands of the Caribbean Sea (collectively referred to as the West Indies) and Bermuda are discussed here. The area includes the large islands of Cuba, Hispaniola (the Greater Antilles), as well as the Lesser Antilles, the Bahamas (and Bermuda). This chapter includes 9 range maps, 7 conifer habitat photos and descriptions, and 11 full-page species profiles (see samples here). With its maritime warm-temperate climate only Australia’s smallest state, the island of Tasmania has conditions suitable for temperate-zone conifers. To these, one species is added here from southeastern mainland Australia. This chapter includes 10 range maps, 6 conifer habitat photos and descriptions, and 10 full-page species profiles (see samples below). Bark is more than just an important feature of a tree’s morphology and identification, it is part of its natural beauty. In Conifers Around the World, there is a selection of 648 characteristic bark photos: 72 pages with 9 images on each page, enough to include for each arboreal taxadiscussed in this work one photo (or sometimse two, rarely three, images) of a typical bark as seen in the most typical habitats. Extremes may be included for some taxa to show their variability or weathering related to their climate and/or habitat. The 28 taxa briefly profiled here are not included in the regional chapters. This chapter discusses infraspecific taxa that differ from the type one in only single or minor characters; taxa described as new after the main manuscript was completed; or taxa for which representative photos were unavailable in a required scale. In addition, some taxa with problematic nomenclature or taxonomy warranted more attention than could be given in the regional chapters. Discussions are included for Abies pseudochensiensis (The Kámon Fir), Callitropsis and Xanthocyparis, The Mexican Cypresses, The “Apulco Ravine Pine”, and The Southern North American Stone White Pines (P. flexilis, P. strobiformis, and P. veitchii).